Faber will be debuting new range hoods at KBIS, see more below. The 2019 Kitchen and Bath Industry Show (KBIS) is fast approaching. Here’s a look at 11 products that will be debuting at the show. KBIS, which is being co-located for the sixth consecutive year with the International Builders’ Show, is heading to Las Vegas this year from February 19-21. It is expected to draw crowds of more than 85,000 design and construction professionals for a week of networking, exhibits, continuing education, and, of course, new products. The manufacturers in the kitchen and bath industry will surely be bringing their “A” game, with demos and displays of all their latest innovations in technology and design. Three convention center halls will be full of more than 600 KBIS exhibitors alone, not to mention the IBS exhibitors covering other sectors of the residential product market. Seeing all of this and more in only three days can be a daunting task. To help, we’ve put together a preview of 11 kitchen and bath products making their official debuts at the show. 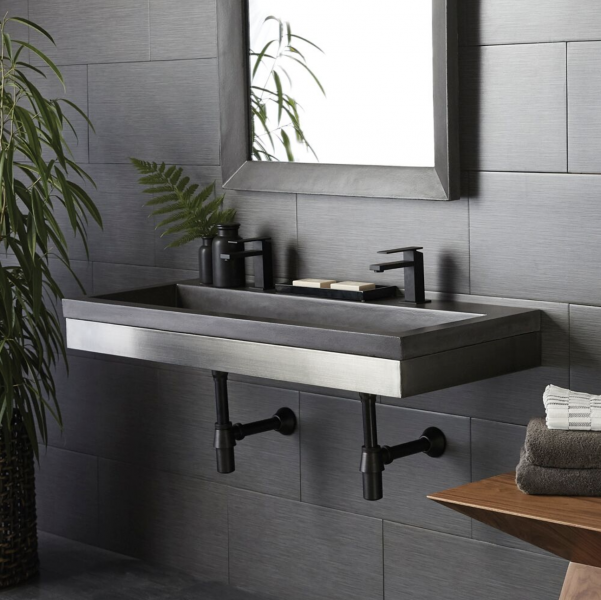 Native Trails will be debuting the new Zaca wall-hung vanity to pair with its NativeStone trough sinks. The vanity is designed to be ADA compliant is available in 36-inch and 48-inch widths. NativeStone, a sustainable material made from natural jute fiber and cement, is lighter weight than traditional concrete products and is available in four colors. 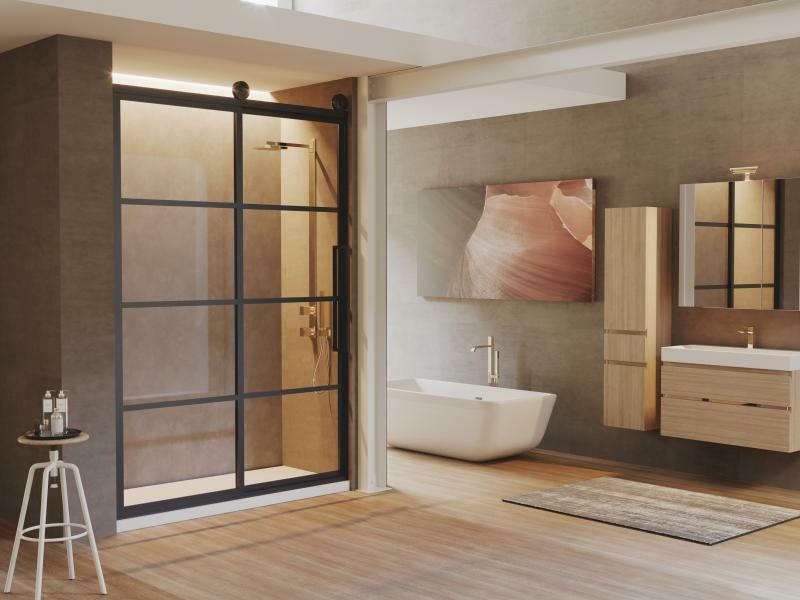 The Eclipse shower door is inspired by barn door design. The door features overlapping glass panels, and can slide closed while keeping out water. A frameless option is available, along with the Gridscape 2 Eclipse (shown), which features anodized aluminum mullions. Doors comes in a black finish with customizable hardware and glass styles. 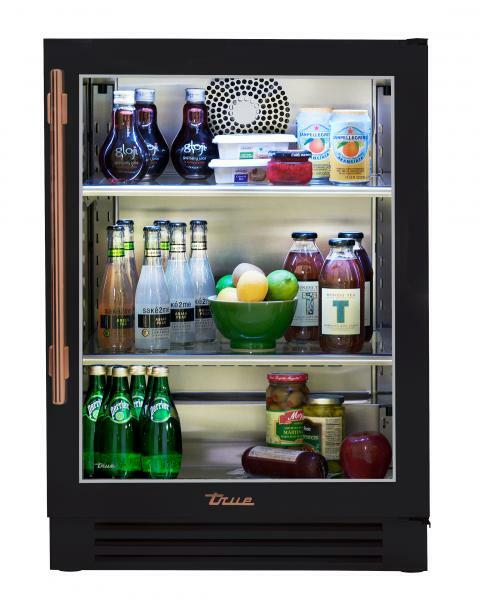 True Residential has added its indoor/outdoor undercounter units to the “Build Your True” program of customizable refrigeration. The program allows homeowners to mix and match a wide variety of appliance and hardware finishes, including refrigeration fronts in stainless steel, gloss black, matte black, cobalt, Antique White, and matte white and hardware in stainless steel, pewter, gold, copper, brass, and chrome. 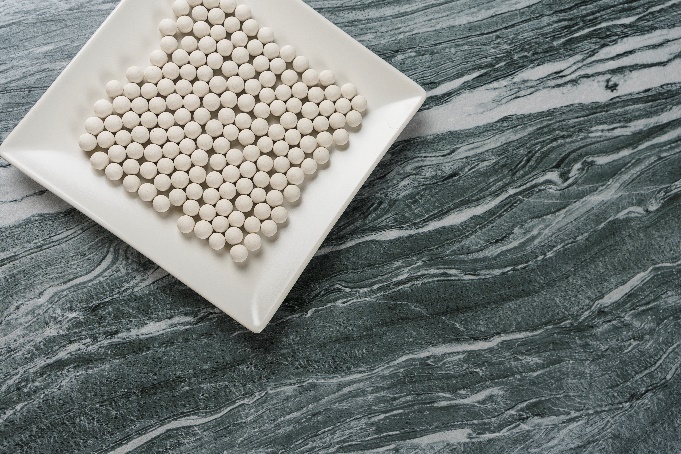 Neolith will be adding four new looks to its collection of sintered stone surfacing. The new colors are meant to closely mimic their real-life surfacing inspiration. Mar del Plata, shown, mixes light quartz with a dark granite look. It is part of the company’s Fusion collection and comes in ¼-inch and ½-inch thicknesses and about 10.5-by-5.25-foot and 10.5-by-5-foot slabs. 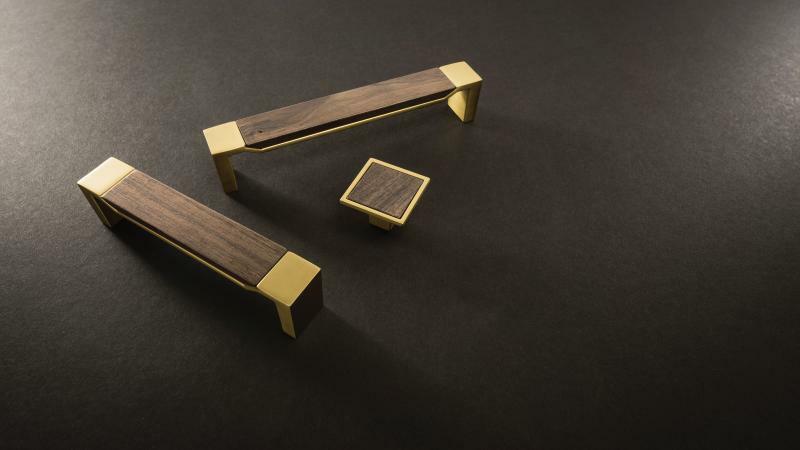 The hardware manufacturer is debuting four new collections at KBIS, including Fuse (shown). This collection blends metal and wood for a modern look with clean lines and angles. It is available in knobs and pulls. After debuting at KBIS last year, Thor is back for a second year with a new product offering. The company is introducing an indoor/outdoor undercounter refrigerator drawer. 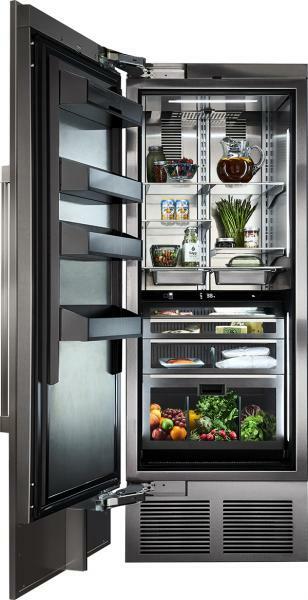 At $1,299, the company claims this unit is the most affordable 24-inch outdoor refrigerator drawer in the industry. It features 304 stainless steel, 5.3 cubic feet of space, pro-style handles, white LED interior lights, and digital controls. The bath faucet and fixture manufacturer is deputing its new PowderRain technology, which releases water in “micro-fine droplets,” the company says. The result is a drenching effect despite a reduced flow rate, decreasing overall water use. 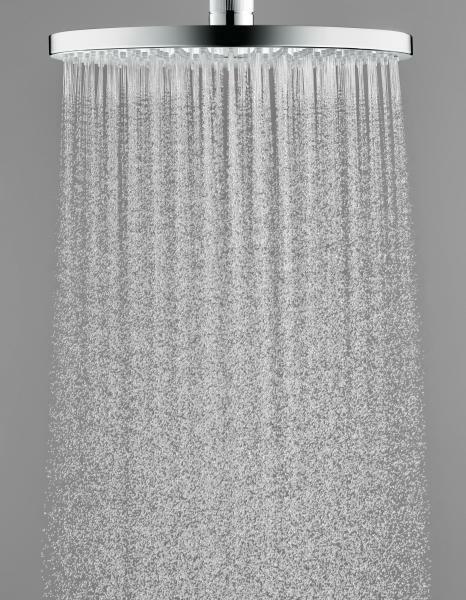 It is available in several of the company’s showerheads, including the Raindance S 240, shown. 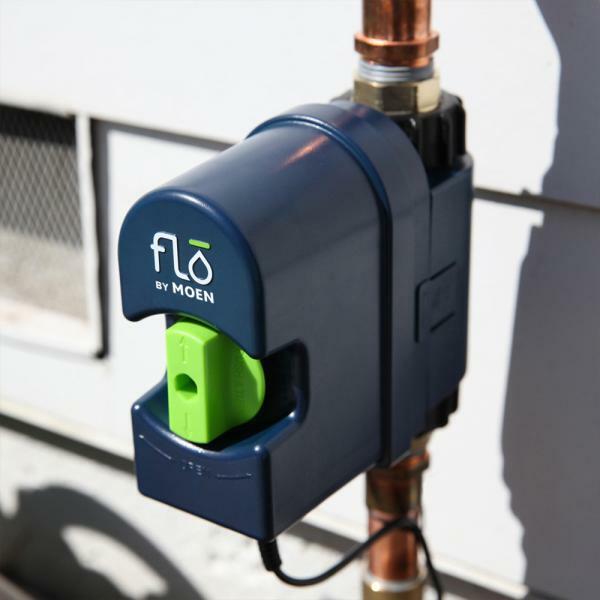 Flo Technologies has partnered with Moen to create this water monitoring and shut-off system, designed to detect and prevent leaks. It also allows homeowners to monitor and control water use remotely and track conservation efforts. Hammerton lighting will be making it’s KBIS debut this year. The U.S manufacturer of custom lighting will be bringing a variety of new designs, all of which are customizable. 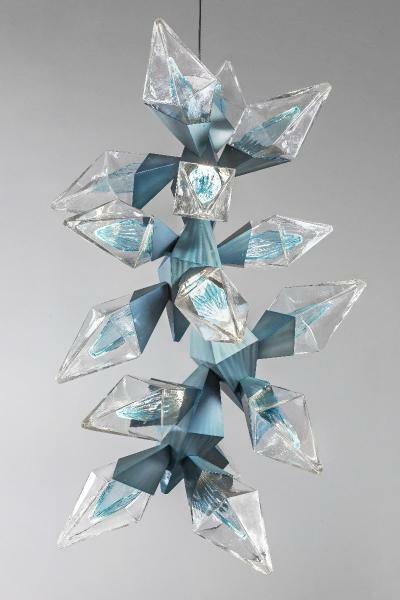 The Element chandelier, shown, is created from blown glass and polished steel. 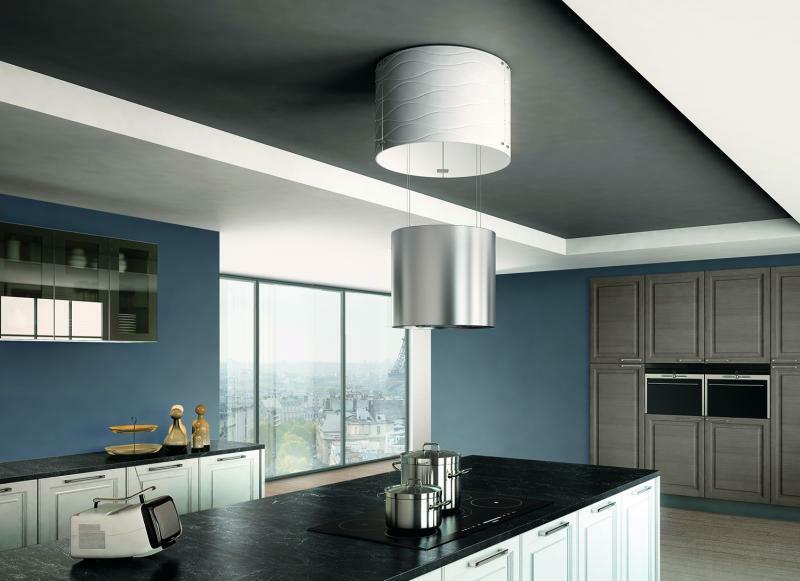 Faber will have a number of new range hoods on display at KBIS, but Zoom is most likely to catch your eye. This hood is designed for use over islands and is housed inside a decorative shade, extending down when in use. The unit includes LED lights, a parametric filter system, electronic touch controls, and can be operated using a remote. It is available in 16-inch or 21-inch widths. Perlick is introducing a 30-inch line of column refrigeration at KBIS this year. The units feature four temperature zones that can be programmed separately for different types of food. The produce bin is independently monitored to maintain humidity levels ideal for fruit and vegetable preservation. The fridge also features a touch screen control panel.